TRUE GRIT. The Coen brothers' adaptation of Charles Portis' 1968 Western novel stars Jeff Bridges as drunken, one-eyed U.S. Marshal "Rooster" Cogburn (the role played by John Wayne in the 1969 film). He's enlisted by young Mattie Ross (Hailee Steinfeld) to kill Tom Chaney (Josh Brolin), the scoundrel who murdered her father. A Texas Ranger named La Boeuf (Matt Damon) joins the posse. 109m. Rated PG-13 for some intense sequences of Western violence, including disturbing images. Opens Wednesday at the Broadway, Mill Creek, the Minor and the Fortuna. LITTLE FOCKERS. It started with Meet the Parents, where we met Gaylord "Greg" Focker (Ben Stiller), his fiancée Pam (Teri Polo), Pam's suspicious, ex-C.I.A. agent dad, Jack (Robert De Niro), and Pam's mom, Dina (Blythe Danner). The sequel, Meet the Fockers, introduced Greg's hippie-ish folks Bernie and Roz (Dustin Hoffman and Barbra Streisand). The third and last episode (thankfully not in 3-D) adds a pair of twins to the mix and touches on parenting and grandparenting. 98m. Rated PG-13 for mature sexual humor throughout, language and some drug content. Opens Wednesday at the Broadway, Mill Creek and the Fortuna. BLACK SWAN. Natalie Portman and Mila Kunis (from That ’70s Show) star as Nina and Lily, rival ballet dancers rehearsing for a production of Swan Lake in a twisted psychological doppelganger tale from director Darren Aronofsky (Pi, Requiem for a Dream, The Wrestler). 103m. Rated R for strong sexual content, disturbing violent images, language and some drug use. Opening Wednesday at the Minor. GULLIVER'S TRAVELS. Jack Black stars as Lemuel Gulliver in an update on Jonathan Swift's classic novel. Gulliver is a would-be travel writer lost in the Bermuda Triangle who is washed up on the shore of Lilliput, a kingdom of tiny folks. While this is a live-action film (in 3-D), director Rob Letterman comes from the animation world: He wrote and directed Monsters vs. Aliens and Shark Tale. Rated PG for brief rude humor, mild language and action. Opens Christmas Day at the Broadway (in 2-D), next Wednesday at the Fortuna (in 3-D) and Mill Creek (in 2-D). The Arcata Theatre Lounge is quiet Xmas weekend, but they have the usual Sci-Fi Pint and Pizza Night next Wednesday. Schlockmeister Roger Corman's Creature from the Haunted Sea parodies gangster and spy flicks and throws in a sea creature in a cheap monster suit. Beast From Haunted Cave was the debut for director Monte Hellman, who went on to do Two-Lane Blacktop and Cockfighter. This one's another mash-up of the gangster and monster genres described by Wikipedia as being source material for Creature from the Haunted Sea. THE FIGHTER. In many ways, The Fighter follows the arc of most boxing films. Based on the story of Lowell, Mass. welterweight Micky Ward (Mark Wahlberg in the film), David O. Russell's film tracks Micky's career from its low point to its zenith, when he takes the WBU Junior Light Welterweight Championship by defeating Shea Neary in 2000. The acting in the film is uniformly excellent, but it's Russell's direction that makes this much more than another boxing story. As he demonstrated in Three Kings and I Heart Huckabees (both with Wahlberg), Russell has a knack for mixing humor with serious themes, making the drama all the more intense. 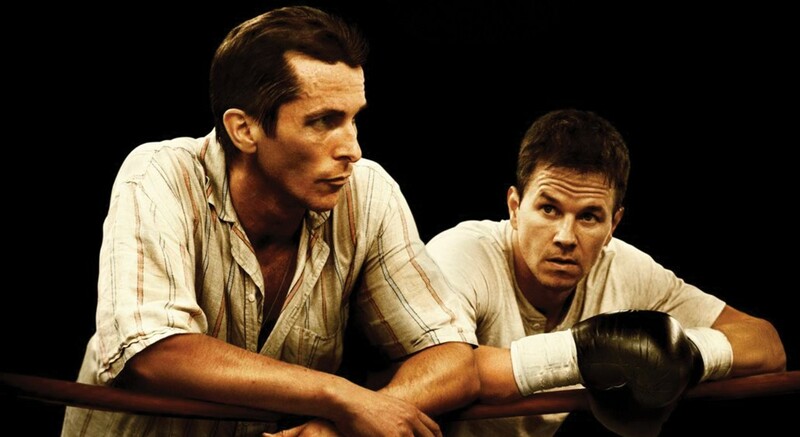 The Fighter begins with an HBO crew filming a documentary about Micky's older half-brother Dicky (Christian Bale), a former boxer who once knocked down Sugar Ray Leonard. The result is a frenetic set of images that are lighthearted in tone, and which briefly introduce the main characters. Dicky is touting the TV movie as the story of his "comeback," but Bale's performance makes it clear that something is seriously wrong in Dicky's life. Indeed, he is a crackhead, and crack addiction is the documentary's true subject. As it turns out, the film's title, The Fighter, applies nicely to everyone in the film. Micky's mother Alice (a ferocious Melissa Leo) is fighting to maintain control over his life, seconded by a bevy of daughters who act like a chorus of Furies. Micky himself is fighting for respect as a boxer and to get out of the shadow of Dicky and his mother. Charlene Fleming (Amy Adams), bartender at the bar where the Wards hang out, is a college dropout fighting for a purpose in her life, and eventually for herself and Micky. The combination of all these fights gives the film its structure and its importance; it becomes much more than the story of a working class boxer rising from the depths. Because of the character he plays, Bale's performance is the film's showiest, and he will no doubt be, deservedly, nominated for Supporting Actor Oscar. But Wahlberg brings total commitment to his role and avoids most of the sentimentality endemic to the genre. It is good to see Adams tackling a serious role again -- she shines as the tough-as-nails woman who stands up to Micky's mother. The boxing scenes themselves, from my limited experience, seem more realistic than most in boxing films, the gold standard for which is Raging Bull. The Fighter is indeed a film about a boxer, but it is also much more. Rated R. 115m. At the Broadway and Mill Creek. HOW DO YOU KNOW. Reese Witherspoon last appeared (except as a voice for animated characters) in 2008's Four Christmases. It's two Christmas seasons later and the best she could come up with during this time is How Do You Know. How dispiriting. This alleged romantic comedy has absolutely nothing going for it. Witherspoon, terminally cute and smiling as always, plays Lisa, a professional softball player who is cut from the squad early on. During the rest of the story she alternates between moping and giving herself pep talks while bouncing back and forth between professional baseball pitcher Matty (Owen Wilson) and about-to-be indicted executive George Madison (Paul Rudd), whose boss is his father (Jack Nicholson). George, dumped by his girlfriend as he faces legal troubles, is in as big a funk as Lisa. Only the ever self-confident Matty seems on top of his game. So, can romance kindle between a depressed ex-athlete and an executive with an existential crisis? Or between said ex-athlete and a self-absorbed superficial successful athlete? Not here. Along the way, the film dabbles ineffectively with the status of professional women athletes and with corporate malfeasance. Witherspoon has demonstrated that she has some heft beneath her superficial sunny side (Election a long time ago; Walk the Line in 2005), but either she or her directors seem to prefer the Legally Blonde mode (the first of which was funny, at least). Rudd and Wilson seem to be on autopilot, while Nicholson adds nothing to his résumé here. Lisa eventually makes the choice director/writer James L. Brooks seems to think is the wise one, but that choice is not earned and the film's end falls as flat as the rest of it. Perhaps this is a new genre: the mopey non-romance. Rated PG-13. 116m. At the Broadway, Mill Creek and Fortuna. TRON: LEGACY. Tron: Legacy is a sequel to Tron, the 1982 Disney film that also generated the arcade video game of the same name which, according to Wikipedia, earned more than the film that year. Legacy picks up the story some 20 years later, with Kevin Flynn's (Jeff Bridges) son Sam (Garrett Hedlund) still brooding about his father's disappearance. When his father's friend Alan Bradley (Bruce Boxleitner, who also plays Tron) gets a page from Kevin, Sam enters the closed Flynn's Arcade and discovers a portal to The Grid, a computer world. The rest of the story involves Sam's attempt to escape The Grid with his father and Quorra (an effective Olivia Wilde), the last ISO (isomorphic algorithms). Attempting to prevent their return to the "User" world is Clu, Kevin's clone, who was supposed to create the perfect world. The film proved more entertaining than I expected, but in the end it's all about CGI with the story a skeleton to support the effects. In that regard, fans should probably see the 3-D version. PG. 127m. 3-D at the Broadway and Fortuna, 2-D at the Minor and Mill Creek. HARRY POTTER AND THE DEATHLY HOLLOWS PART I. The final chapter begins! If you can't wait for Part II, the script is available in book stores everywhere! Rated PG-13. At the Broadway and Garberville. TANGLED. Disney checks the Rapunzel box off its "fairy tales to animate" list with its latest kid-seducing 3-D computer generated release. Rated PG for brief, mild violence. 100m. At the Broadway and Fortuna. YOGI BEAR. Mr. Ranger is not going to like this ... movie. Rated PG. 83m. At the Broadway, Fortuna and Mill Creek.